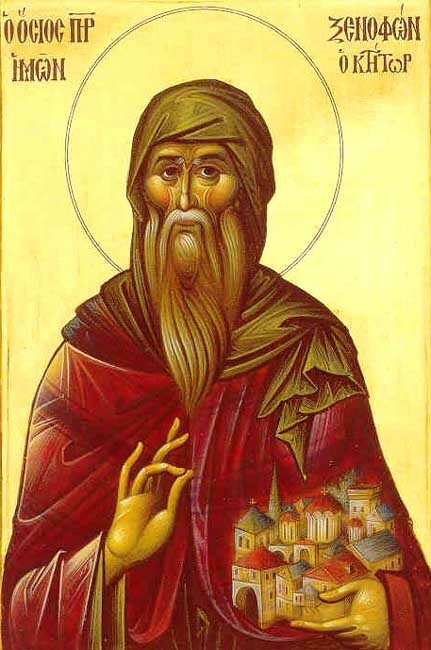 Saint Xenophon (or Xenophontos) lived at the end of the tenth century as an ascetic on Mount Athos. He was from a known and wealthy family and received an excellent education. 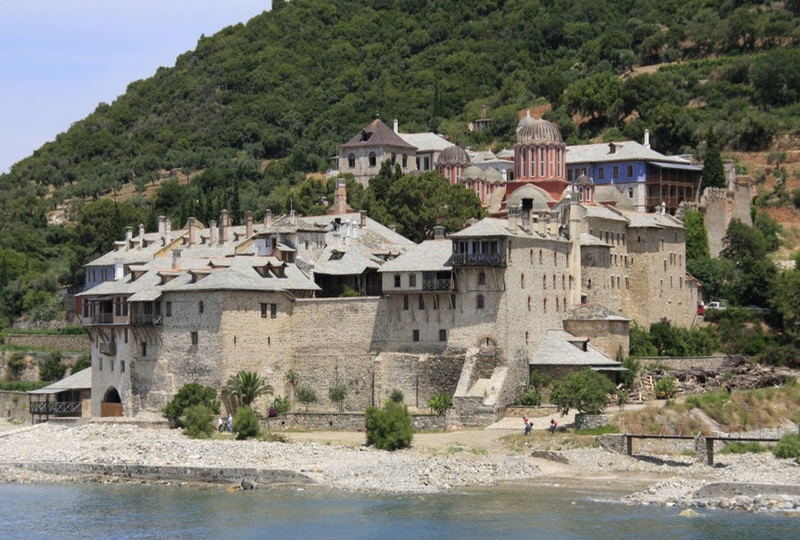 While living at the same time as Saint Athanasios the Athonite, who founded Great Lavra Monastery on Mount Athos, he and his brother Theodore visited him, and Theodore was healed by Saint Athanasios from an incurable case of cancer. 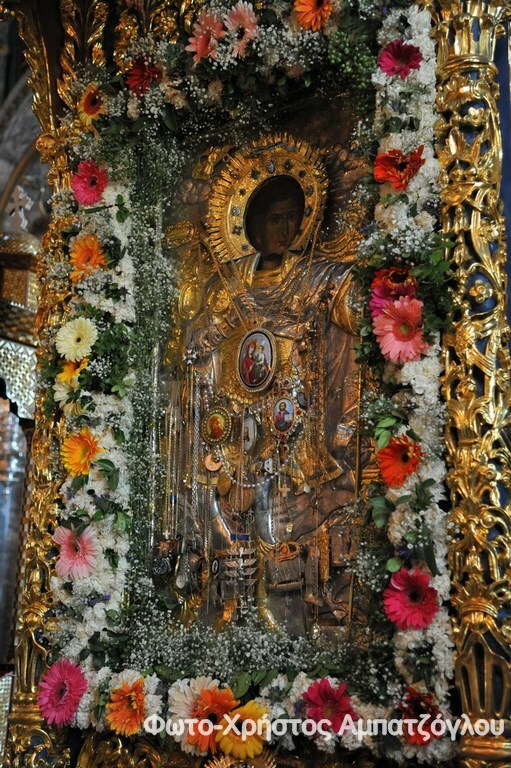 When Xenophon arrived at the area where the Monastery stands today that bears his name, he found there a small chapel dedicated to Saint Demetrios the Myrrhgusher which contained the miraculous icon of the Holy Great Martyr George. 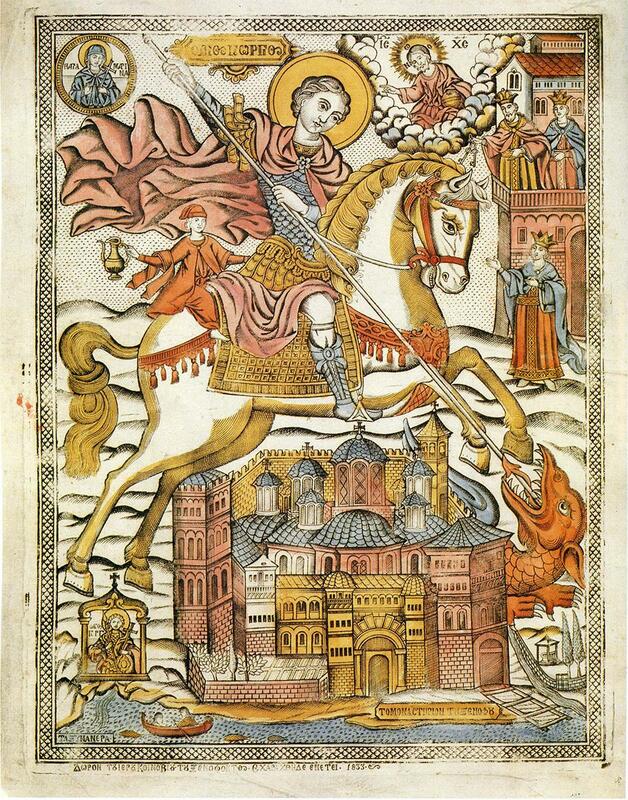 This icon was in Constantinople during the days of Iconoclasm. 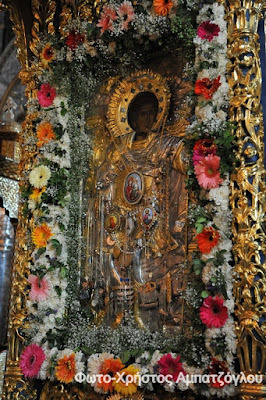 It had been thrown in the fire by iconoclasts, like so many other icons, but it was miraculously preserved unharmed. Then one of them took out his knife and struck the icon on the chin of the Saint, at which it immediately began to bleed. This mark can be observed on the icon which is still preserved at the Monastery. As soon as this happened, the iconoclasts fled and a pious Christian took the icon and brought it to the sea. After praying to God to preserve the icon, he cast it into the sea and it arrived in the area where Xenophontos Monastery is located. 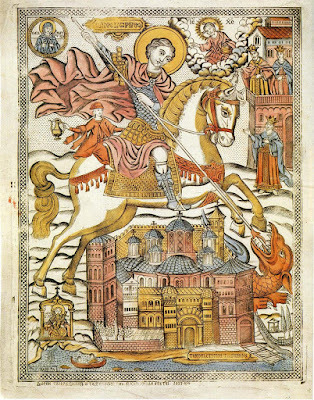 When Saint Xenophon learned of the miraculous story of this icon of Saint George, he funded with his own money the building of a magnificent Monastery to be dedicated to Saint George and to house his miraculous icon. This Monastery also became under his direction a gymnasium of asceticism, obedience and humility, with an emphasis on prudence, hospitality and love. It was established in the year 998. Before he departed this life, Saint Xenophon gave the abbacy of the Monastery to his brother Theodore, and he reposed in peace some time between 1018 and 1035.